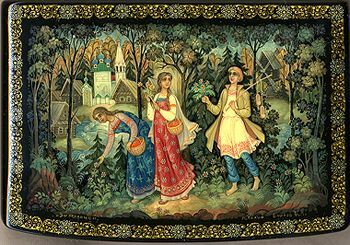 IMPORTANT NOTE: this box is currently displayed on Expo in the All-Russia Museum of Folk and Applied art in Moscow devoted to the 80th anniversary of Kholui Art. The Expo was opened on the 12th of November and will take a place till the 6th of December 2014. Kholuy artist Vladimir Blinov paints this scene entitled "On the outskirts of a village". The talented artist frequently paints folk themes such as this one. Here he depicts a young man and two young women picking flowers, roots, and mushrooms. The edge of the forest is the most common place to find such items, since young people did not venture far into the forest because of the possible threat danger. Instead, with the knowledge that they are safe if they stay in close proximity to the village, they stroll at their leisure making conversation and passing the time before they have to get back to the village for supper. The palette used by Blinov is the typical one he uses, that is full of cool and subdued colors. His style is very traditional to the Kholuy way of painting and his love for his work permeates from his soul to the box. The linear structure of the box flows and does not contain rigid lines or sharp corners, giving the piece a quality of remarkable degree. Gold paint is used to highlight specific aspects of the scene. The clothing of the girls, flowers, and most obvious the sky in the background, which are all in some way touched with gold paint, gives richness and life to the composition. The exterior of the box including the edges of the lid and the box's sides are decorated with gold and aluminum floral patterns painted in an intricate and precise manner. The box is crafted out of dense and strong paper-mache. The box has a hinge located above the composition and rests on a flat bottom. The exterior of the box is painted with black lacquer and the interior is painted with red lacquer. The work is titled ("On the outskirts of a village"), and signed by the artist.